Providence's vast outdoor recreation area has lakes and forests, playgrounds, paddleboats and carousels for the kids, beautiful scenery, picnic areas, even a Natural History Museum. South of the city on Elmwood Avenue (I-95, Exit 17), Roger Williams Park boasts magnificent restored 19th-century Victorian buildings, the Charles E Smith Greenhouses, a Museum of Natural History, the Roger Williams Park Zoo, and amusement area besides its 430 acres of beautifully kept lawns, copses, lakes, and paths. The park is open to the public for free, and special concerts and programs are scheduled throughout the summer. In summer, kids paddle in goose-shaped boats along its lakes and streams while other kids enjoy the classic carousel (Merry-go-round) right next to a toddlers' playground and a bigger kids' rock-climbing tower, while parents relax on a picnic blanket with a book, a radio, or the newspaper. The Roger Williams Park Zoo harbors nearly a thousand animals, and is a favorite for both kids and adults. If you need a morning, afternoon or all-day getaway from the city or the highway, this is the place. 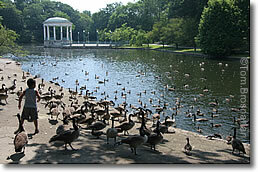 Above, feeding the ducks and geese, Roger Williams Park, Providence RI. 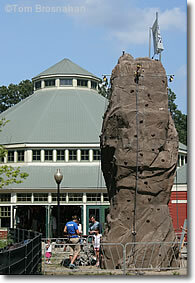 Below, the rock climbing structure next to the carousel (merry-go-round).